Faraway Press: The Online Home of John Jackson Miller: More on Star Trek Titan: Absent Enemies -- and a new Trek novel for 2015! 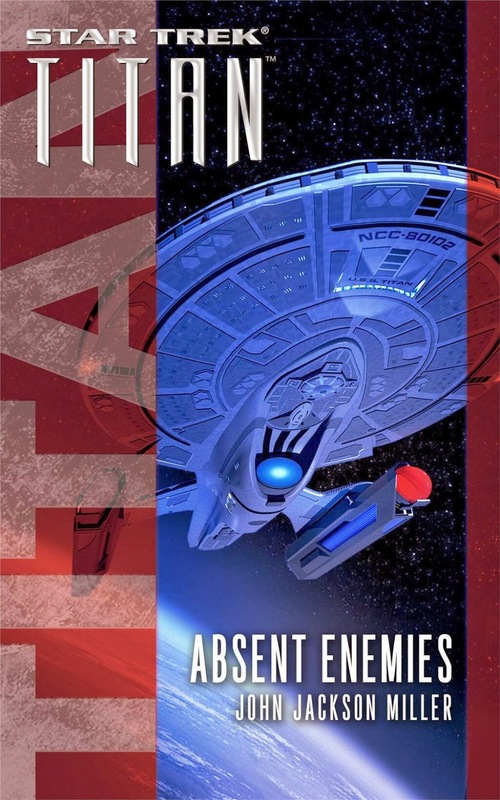 More on Star Trek Titan: Absent Enemies -- and a new Trek novel for 2015! (UPDATED 2/13, with the Absent Enemies cover!) It's been as cold as Mars (or Hoth, or Rura Penthe, or whatever chilly world you care to imagine) in Wisconsin this winter, but it's been good weather for writing. As always, I have a number of different projects on the desktop, both original and licensed — and I'm now able to share one of them, just announced by Simon and Schuster editor Margaret Clark on today's Trek Collective podcast. Following my debut in the Star Trek universe with next month's Titan: Absent Enemies e-novella, I have a full-length Star Trek novel releasing in 2015! It's as Margaret describes: I had a lot of fun writing the novella, and was struck with a great idea for a stand-alone adventure novel set in the 24th Century era. It turned out to fit in well with Pocket Books' plans to focus on missions of exploration, as Margaret describes in the podcast, so I'm pleased to be doing it. As she says in the interview, it involves the Aventine, the ship of Ezri Dax (who you may recall from Deep Space Nine and many fine Trek novels); there are also many characters familiar to viewers of The Next Generation with major roles. Far too early to say anything else, other than it should be a blast to read! A thrilling e-novella based on Star Trek: The Next Generation, following the dramatic events as chronicled in the New York Times bestselling story arc The Fall! That's right: we've got both TNG-series era Enterprise scenes in Absent Enemies as well as "present day" moments for recently-promoted Admiral Riker, in what really was an enjoyable story to write. I expect to be able to share the cover soon, but in the meantime, you can preorder Absent Enemies, which is e-book only, at Amazon, Barnes & Noble, and at iTunes, among other retailers. That's the news of the morning: now, back to work for me. It's already a busy year!